﻿﻿​This project started with the main focus on the love,kindness, and friendship of Jared, Jensen, and Misha. So our group decided to choose three charities that they care deeply about and have devoted their time to. For Jared Padalecki we went with the Always Keep Fighting Campaign. This campaign that started off as a simply message to keep fighting your demons and a t-shirt to help raise money and awareness has turned into so much more. Not only did Jared save peoples lives by simply letting people know they are not alone in their struggles, but he inspired others to step up and help those in need. Jensen Ackles is usually seen backing up Jared or Misha when it comes to charity but this man has one that is close to his heart. Jensen's nephew, Levi, has down syndrome and last year the Woman of Letters Dallas Chapter organized a fundraiser. They did the buddy walk in Dallas which is hosted by the non-profit charity Down Syndrome Guild of Dallas. They were able to raise over $350,000 and the whole Ackles family and members did the buddy walk together, including little Levi. Finally Misha Collins started the charity Random Acts with the simple concept that you could change the world with one small act of kindness at a time. That being kind to someone could save their life and we should all be kinder to one another. It has grown from that idea and they have been able to do some amazing things in Haiti and Nicaragua, as well as hosting the ever insane G.I.S.H.W.H.E.S event every year. So because our group did not want to pick just one charity to donate to we decided to have one mass fund account. This means that if you would like to donate or you gear up with some of our unique fan inspired one-of-a-kind merchandise all the money goes into one account. Then at HousCon 2017 all the money will be split into three equal checks and one handed to each of these men. That way each charity gets the same amount and everyone gets recognized. Wristbands can be easily worn everyday with any type of outfit. This is an easy, inexpensive, and amazing way to show your support of the three charities we are raising money for. With using the website gear bubble we will be able to have multiply unique t-shirt designs. We will also soon have beanies, among other things. 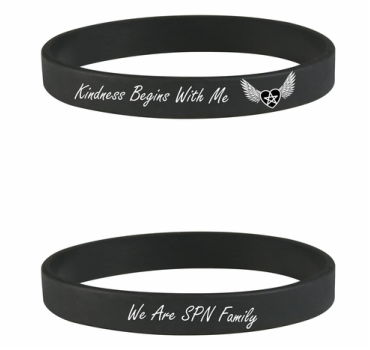 The ideas for these items come from the SPN family group and all the profits go towards the three charities. * Photo in heading does not belong to me. Was taken at DCCON 2015.